The cash ratio, sometimes referred to as the cash asset ratio, is a liquidity metric that indicates a company’s capacity to pay off short-term debt obligationsCurrent LiabilitiesCurrent liabilities are financial obligations of a business entity that are due and payable within a year. 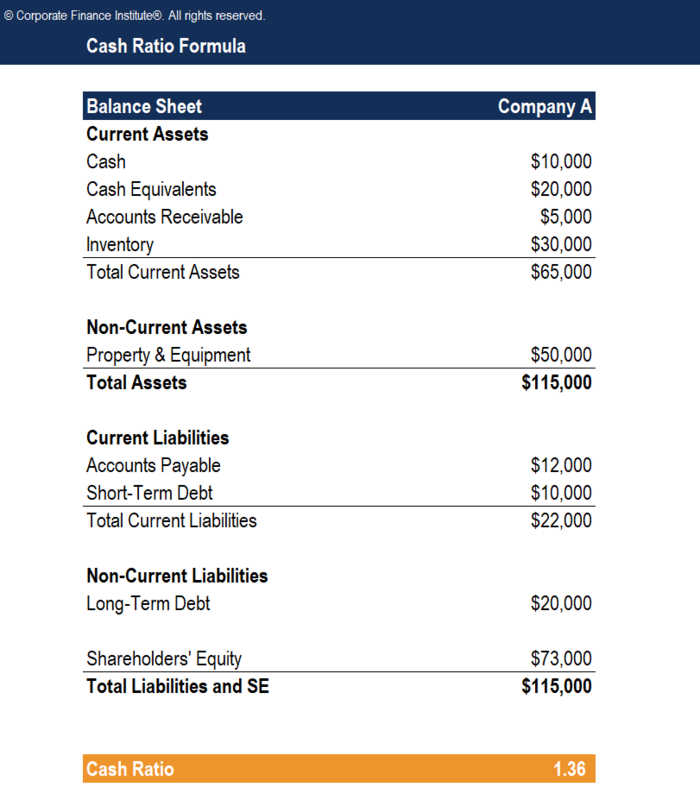 A company shows these on the balance sheet. A liability occurs when a company has undergone a transaction that has generated an expectation for a future outflow of cash or other economic resources. with its cash and cash equivalents. Compared to other liquidity ratios such as the current ratioCurrent Ratio FormulaThe Current Ratio formula is = Current Assets / Current Liabilities. The current ratio, also known as the working capital ratio, measures the capability of a business to meet its short-term obligations that are due within a year. The ratio considers the weight of the total current assets versus the total current liabilities. and quick ratioQuick RatioThe Quick Ratio, also known as the Acid-test or liquidity ratio, measures the ability of a business to pay its short-term liabilities by having assets that are readily convertible into cash. These assets are, namely, cash, marketable securities and accounts receivable. These assets are known as "quick" assets since, the cash ratio is a stricter, more conservative measure because only cash and cash equivalents – a company’s most liquid assets – are used in the calculation. Cash includes legal tender (coins and currency) and demand deposits (checks, checking account, bank drafts, etc.). Cash equivalents are assets that can be converted into cash quickly. Cash equivalentsCash EquivalentsCash and cash equivalents are the most liquid of all assets on the balance sheet. Cash equivalents include money market securities, Bankers Acceptances, Treasury bills, commercial paper, and other money market instruments. are readily convertible and subject to insignificant risk. Examples include savings accounts, T-billsTreasury Bills (T-Bills)Treasury Bills (T-Bills) are a short-term financial instrument that is issued by the U.S. Treasury with maturity periods ranging from a few days to 52 weeks. They are considered the safest debts since they are backed up by the full faith of the Treasury Department of the United States Government. When an investor buys, and money market instruments. Current liabilities are obligations due within one year. Examples include short-term debt, accounts payableAccounts PayableAccounts payable is a liability incurred when an organization receives goods or services from its suppliers on credit. Accounts payables are expected to be to be paid off within a year’s time, or within one operating cycle (whichever is longer). AP is considered one of the most liquid forms of current liabilities, and accrued liabilities. The figure above indicates that Company A possesses enough cash and cash equivalents to pay off 136% of its current liabilities. Company A is highly liquid and can easily fund its debt. Enter your name and email in the form below and download the free cash ratio template now! The cash ratio indicates to creditors, analysts, and investors the percentage of a company’s current liabilities that cashCashIn finance and accounting, cash refers to money (currency) that is readily available for use. 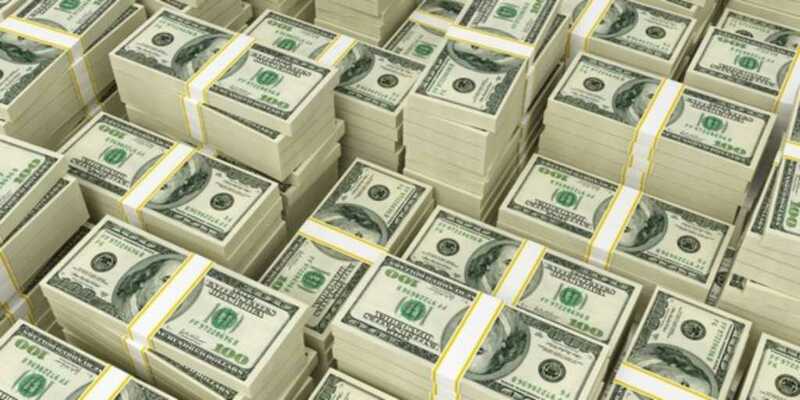 In economics, cash refers only to money in the physical form. and cash equivalents will cover. A ratio above 1 means that the company will be able to pay off its current liabilities with cash and cash equivalents, and have funds left over. Creditors prefer a high cash ratio, as it indicates that the company can easily pay off its debt. Although there is no ideal figure, a ratio of not lower than 0.5 to 1 is usually preferred. The cash ratio figure provides the most conservative insight into a company’s liquidity since only cash and cash equivalents are taken into consideration. It is important to realize that the cash ratio does not necessarily provide a good financial analysis of a company because businesses do not ordinarily keep cash and cash equivalents in the same amount as current liabilities. In fact, they are usually making poor use of their assets if they hold large amounts of cash on their balance sheet. When cash sits on the balance sheet, it is not generating a return. Therefore, excess cash is often re-invested for shareholders to realize higher returns. The cash ratio is a liquidity ratio that measures a company’s ability to pay off short-term liabilities with highly liquid assets. Compared to the current ratio and the quick ratio, this is the most conservative measure of a company’s liquidity position. There is no ideal figure, but a ratio of at least 0.5 to 1 is usually preferred. The cash ratio may not provide a good analysis of a company, as it is unrealistic for companies to hold large amounts of cash. Acid-Test RatioAcid-Test RatioThe Acid-Test Ratio, also known as the quick ratio, is a liquidity ratio that measures how sufficient a company's short-term assets are to cover its current liabilities. In other words, the acid-test ratio is a measure of how well a company can satisfy its short-term (current) financial obligations.